Maui has been missing since May 13. He was startled and bolted into the woods behind his family's home. Since he's been out so long, he is survival mode. It is unlikely he will approach a person, respond to his name or possibly even a squawker. If seen, do not chase, do not pursue. Just call in location with info about his condition and whereabouts. He is not following any patterns, he appears to be roaming each night and moving on to new territory each day. Setting up a food station and camera has not been fruitful in our attempts for the last 4 months. All we can do at this point is hope he will approach someone and be captured. We do need people to be kept aware he is out there and if he does approach someone, they need to take him in. Previously, we were operating on a bait and capture strategy. If we can get enough sightings in one location, we can restart this strategy. We need sightings of his location, then we will setup a food station, get him to come consistently (watching via camera) and eventually set a trap to capture him. We have one chance at setting the trap. If he gets scared of it, or it comes down but he's able to get away, he will never get in it again. This is a strategy used by many dog search and rescues in the past and comes as advice from a professional tracker hired by the family. We cannot fly a drone as this area is inside the no-fly zone for Dulles airport. We need people spreading the word In Person and ONLINE. Share on your local facebook community website if you are in Reston/Vienna/Oakton…anywhere along the W&OD trail. Tell your friends and neighbors that he’s still on the loose. That is the only way we will get tips. Lost dog update 9/3: Sighting on 9/2 at Fox Mill Rd and John Milton Dr.
Lost dog update 8/16: Sighting from 8/12 confirmed as Maui. 2219 McChesney Ct, Vienna, VA 22181. We need people near the W&OD trail in Vienna area to spread the word. People may be seeing him but not know it's Maui. We NEED more tips!!! Lost dog update 7/16: No new sightings since 7/9. Lost dog update 7/9: Late afternoon sighting Barton Hill Rd and Harpers Square CT heading toward Twin Branch Rd. 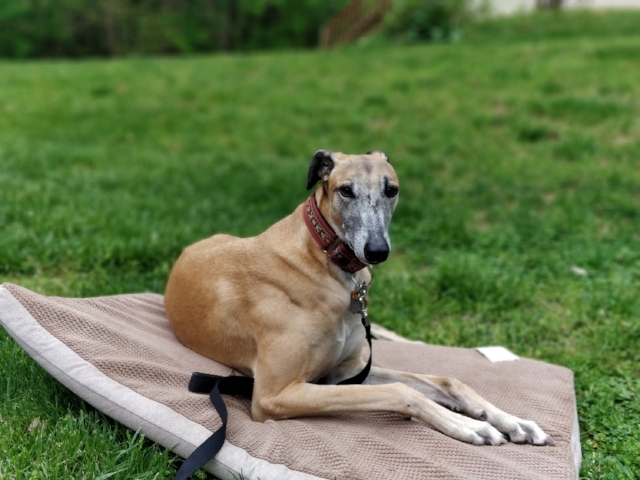 Lost dog update 7/8: 9PM sighting in Oakton near Valeview Dr. This is really close to Wayland St Park where Maui was spotted a few weeks ago. Lost dog update 7/3: Maui sighted around 4:30 PM off Oakton Ridge CT. People went out to search but no luck. Restocked feeding/water station. For real-time updates join the Maui mailing list at the bottom of the page! that Maui has somehow managed to cross the Dulles Toll Road. Special update 6/8: We picked up dog footprints near the sighting location (38.889553, -77.328383) from earlier today on Gerry Connelly Trail at about 7:30PM. We followed the footprints for about 0.75 miles or so until our hounds got tired, then my wife turned back (there will be multiple pairs of dog prints out to that distance). I kept going alone for quite a distance. At coordinates 38.896770, -77.319885 I found fresh dog footprints off the main trail (there is a semi-groomed path leading to the river). Near the water there were a significant number of dog footprints with zero human footprints anywhere nearby (see photo in comments, the human prints are mine). I continued to follow the Gerry Connelly trail for quite a bit more and approached an area known as Stevens Family Bridge at coordinates 38.898481, -77.316742. Just prior to the bridge the path forks to the right or you can continue on Gerry Connelly trail across the bridge. There was a small pool of mud in the area with a significant number of paw prints heading in each direction (again with no human prints). I couldn't identify a clear direction where the dog might have gone and turned back since we were meeting a thermal drone operator at 8:30PM. In all cases, the prints were the correct size and shape for a greyhound about Maui's size (they are very close to our hound's prints). We launched a drone with a thermal camera at about 9:00PM from coordinates 38.901719, -77.320267. The location is very close to the edge of restricted airspace. We were only able to travel about 600 feet towards Stevens Family Bridge before the drone reached restricted airspace and did not allow us to go further. The fact that we couldn't fly closer prevented us from being able to investigate a hot spot (a single animal seen by the drone, not moving). It is difficult to determine the precise location of the hot spot, but it looks like it was past Stevens Family Bridge and closer to Stepping Stone Bridge around coordinates 38.899823, -77.316533. Lost dog update 6/1: We need people to put out flyers and look for Maui this weekend (Saturday and Sunday). This is an interactive map of zones he's been sighted or tracked to. Even an hour of time can make a big difference. We hope this will result in big progress. Lost dog update 5/31: Promising news! We think Maui is hanging out in the neighborhood located at the link below based on tracker data. We need flyers and lots of them in this area, so residents start calling in multiple sightings. This is what we need before we setup a trap. Lost dog update 5/29: NEW SIGHTING!!!!! We need people to continue to flyer the area to get more sightings so we can narrow down the search area. Thanks to everyone who put out flyers and came out to look for Maui this weekend. We appreciate it and are not giving up! If you know someone who can lend us a trail camera, or someone that has a drone and license to operate in Oakton, please let us know. Suggestions and help in all ways are always welcome. Lost Dog Update 5/20: We are coordinating a drone search of the area tomorrow, Sunday, May 20. If you have a drone or know someone with a drone who is willing to help, please join us tomorrow. The area is heavily wooded so thermal imaging is preferred, but visible imaging is still valuable in some areas. A search grid will be posted in the comments section, below. Please send an email to maui@brga.org when you've searched a single grid cell, along with the time and type of imaging (visible or thermal). Please retain the videos and we will work on posting them to get a second or third set of eyes on them. If you don't have a drone, we would love to have you walk the nearby trails or subdivisions, just please leave your hounds at home so we don't confuse the drone pilots with false positives! Lost Dog Update 5/19: No new sightings. We have set up a website to host some of the larger files and give people an opportunity to join a mailing list for Maui where we will coordinate searches and provide up-to date information. Also, if you have some time, please distribute flyers to homes and businesses within the grid cells. Please send an email to maui@brga.org if you complete a set of homes within a grid cell or with specific names of businesses you provide flyers - we will try to keep a list posted to prevent duplicative efforts. Maui Update 5/17: No new sightings, but the tracker has identified a number of locations where Maui has been (posted in comments below). Maui Update 5/15: No new sightings. A tracker has been hired to help with the search. We will update you when we need volunteers. Maui Update 5/14: Spotted! In the woods. Maui went missing on May 11, 2018 in the Miller Heights neighborhood of Oakton, VA. Please send any tips to maui@brga.org.